Mark Guishard, who heads the Risk Prediction Initiative at BIOS, was elected in June as a Fellow of the Royal Meteorological Society, an organization of professionals and scientists dedicated to the understanding of weather and climate. 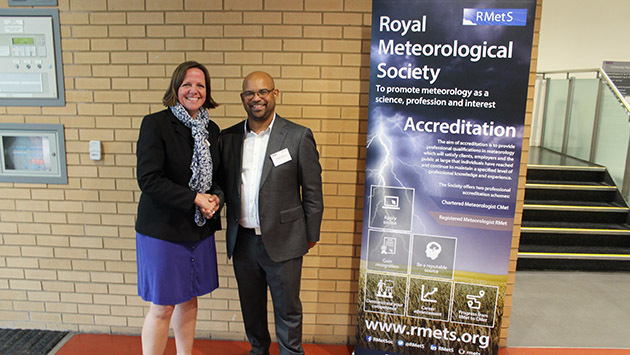 He also received the designation Registered Meteorologist from the society’s chief executive Prof. Liz Bentley during their annual conference, held at the University of Manchester in the United Kingdom. “It is an honor and a privilege to be recognized by my peers in academia and the profession of meteorology,” he said. “This achievement comes from the support and encouragement of my family, teachers, employers, and mentors.” Guishard began his 20 years of work in atmospheric sciences with the Bermuda Weather Service in 1997, which he went on to direct for six years until 2012.